A new study states that only 5% of teens in the USA are following recommended guidelines for screen time, sleep and physical activity. The study points out that failure to meet these guidelines is a risk factor for health problems such as obesity, mental health problems including depression, and engaging in at-risk behavior such as the use of tobacco. The authors also cite research pointing to adverse effects on academic achievement. The study, “Prevalence and Likelihood of Meeting Sleep, Physical Activity, and Screen-Time Guidelines Among US Youth” was published in February 2019 in JAMA Pediatrics. The study followed almost 60 thousand youth for 6 years. The resulting recommendations (ages 14-18) are to limit all screen time to 2 hours, sleep for 8-10 hours a night, and accumulate at least 1 hour of aerobic physical activity each day. While this research focused on teens, a similar study published in Lancet in 2018 found that only 5% of children ages 8-11 meet all the guidelines for that age group and almost 30% met none of the recommendations. The suggestions for children ages 6-12 call for 9 to 12 hours of sleep, 1 hour of physical activity, and less than 2 hours of screen time. The AAP even developed the Family Media Plan, a useful tool available at www.healthychildren.org. This resource helps families schedule and create goals around the amount of time that each member of the family spends watching TV, using a computer, tablet, smartphone, or playing video games. Social Interaction. It is not uncommon for a growing number of kids and teens to spend most or sometimes all of their interaction with others through texting, calling, gaming, and social media. Personal communication with others is limited, and social and conversational skills are affected. Kids need contact with other kids to develop healthy relationships with each other. Physical Health. Too much time sitting promotes poor eating habits and lack of physical exercise. Being too focused on a video game or computer activity interferes with intentional, healthy eating. A child is more likely to snack on foods that aren’t nutritious. Learning. Studies have shown that children who spend more than two hours a day in front of the TV or another device have a more limited vocabulary, experience homework problems, and are at a higher risk for being diagnosed with Attention Deficit Disorder. Other research indicates that reading is a more powerful learning tool than digital devices including the computer. Sleep Problems. Many kids take their phones or computers to bed with them. The hours before bedtime can make the difference between a good night’s sleep and interrupted sleep. The lights from these devices trick the brain into thinking it’s daylight, as well as cause over-stimulation. Behavioral Problems. A recent study published in Pediatrics indicates that children who watch television or play computer games for more than two hours a day have a higher risk of psychological problems. This study examined over 1,000 children between 10 and 11 years of age and found that violent movies or video games can contribute to aggressive behaviors and fights with family and friends. In my upcoming book (March 2019), The Well-Balanced Family: Reduce Screen Time and Increase Family Fun, Fitness, and Connectedness, I present a whole family approach to reducing the use of digital devices by all family members. I provide suggestions on how to use the newly available time to spend more quality time together as a family, as well as supporting each other to develop a more healthy, productive and enjoyable lifestyle. The book focuses on four areas: Connectedness, Open Communication, Fitness, and Organization. Using an evidence-based approach, I help parents learn how to encourage developmental play activities, develop avid readers, instill cooperation and mutual respect, improve physical fitness, build self-esteem and character, and reduce struggles over bedtime, chores, and homework. The book also provides tips for helping kids to make the most of their screen time safely. You will learn how you can reconnect as a family by planning fun and healthy activities, establishing regular routines and good habits—while ditching the electronics. The Value of Play: Learn what free play is, and how it can help encourage your child to use their imagination and become more independent. How to Be a Fit Family: You’ll find plenty of tips on ways your family can stay active together, with suggestions for kids of all ages, from toddlers to teens. The Importance of Family Meetings: Learn how to schedule regular check-ins with your family to make sure everyone’s opinions are heard, and every family member feels valued. Creating Structure: Help children stay focused by creating a regular schedule to follow. This will help them feel secure and keep you organized. Teach responsibility by assigning age-appropriate chores. Bedtime Issues: Stop the endless debates with your child when it’s time for bed by learning how to listen to and validate their feelings. Power Struggles: Learn how to communicate compassionately while still teaching your child that as their parent you are in charge. Homework Issues: Create a quiet, organized environment for your child that will help them concentrate on homework assignments. Get Active: Is your child more interested in video games than getting outside? Discover activities that will get your kid moving. Unplugging: Focus on how you can get your family members to put down their electronic devices and start communicating. Designate areas of your home that should be screen-free. This should include bedrooms–at least a bedtime. There should be no televisions in a bedroom for children and teens. All other electronic devices should be stored outside the bedroom before bedtime. Another area should be the dining table; not just during family meals, but for any time someone is eating there. Parents can teach their kids mindful eating. This helps reduce food consumption and improves digestion. Family mealtime should become an opportunity for positive interaction and open communication between all family members. If possible, an office/study room can be available with access to a computer, books, and other materials for work or study. A bulletin board placed on a wall could serve as a place to post homework schedules and reading logs. It’s best if kids have a designated area for work as it improves concentration and task completion. Buy a docking station that is large enough to accommodate all of the family’s portable devices (phones and tablets) and place it in a central location. Devices can be plugged in when entering the home and should remain there except for agreed-upon times for their use. Ideally, parents should wait to retrieve texts or phone calls until times when they’re not engaged in family time. Better yet, if possible, save that activity for after the kids are in bed. 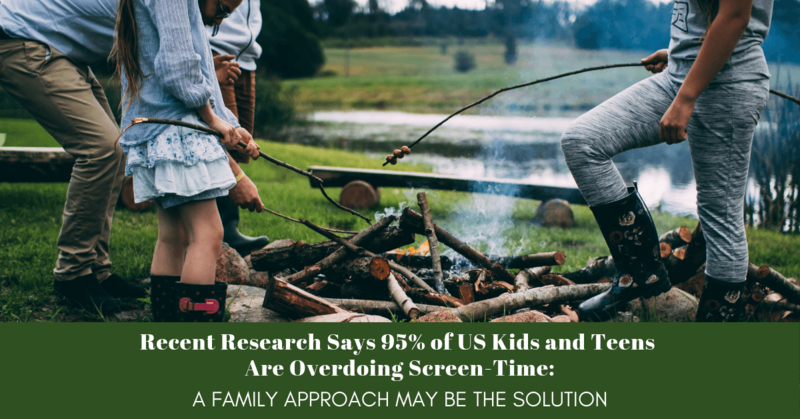 Each member of the family should have a daily activity schedule that includes screen time. You can discuss this at a family meeting. At the meeting times, limits for each member of the family can be set and agreed upon. Times may vary based on the age of the child. This process may not be easy, but it’s a good topic for problem-solving. You may want to spend time with each child helping them to come up with their own priorities of what shows to watch and other activities to fit within their time limit. Screens should be turned off when engaging in socialization or other activities such as completing homework. Distraction during social exchanges or multitasking is always counterproductive. Parents need to be role models. Agree to limits on your own use during family meetings and stick with them. You can use Screen Time to monitor your use and set limits. In addition to the above, learning how to set parental controls on various devices is very important. By using these tools, you’ll be able to monitor your child’s usage, set time limits, and restrict their use to age-appropriate content. Common Sense Media is a nonprofit organization with lots of valuable information for parents regarding appropriate content for children including television, movies, apps, and video games. Please be sure to visit this website and subscribe to their newsletter.